I've been wearing glasses for a million years. My eyesight is ridiculous, I mean, pretty much blind. I used to have to wear an eye patch. Not a look I would go for nowadays, but I have learned to embrace my glasses. Anyway, a few weeks ago I received these glasses* from glassesshop.com and today, I felt like doing a little review on them. Anyone who wears glasses knows the absolute struggle of finding a pair that suits your face, are comfortable and don't push against your eyelashes, aka the worst feeling ever. It's so important to try on glasses when you're buying them to make sure they are the right ones for you and, because of this, I was nervous when I was choosing them online. Glasses Shop have such a huge selection of frames so I spent a lot of time browsing before I settled for the ones pictured above. They actually come in black, floral and crystal as well, but I decided on the tortoise pattern because it was something a little different from my usual black frames. It took quite a while for my glasses to arrive but, considering they come from China I wasn't too worried and I could easily track my package the entire time. When my glasses arrived I actually didn't love them because they were really big and kind of out of my comfort zone but, after wearing them around the house a bit, and trying them on with makeup I actually love them. They have become my go-to glasses and I have received SO many compliments on them. Everyone is always asking me where I got them! I was a bit worried about my prescription, as I didn't think it would be accurate but I am so happy with them. They are perfect, fit my face and are comfortable, and you can also get prescription sunglasses too which is fab! Glasses Shop currently has a promotional offer of buy on get one free when you use the code 'GSBOGO' at the checkout. If you're looking for a pair of fashion glasses, or prescription glasses I would highly recommend the GlassesShop! 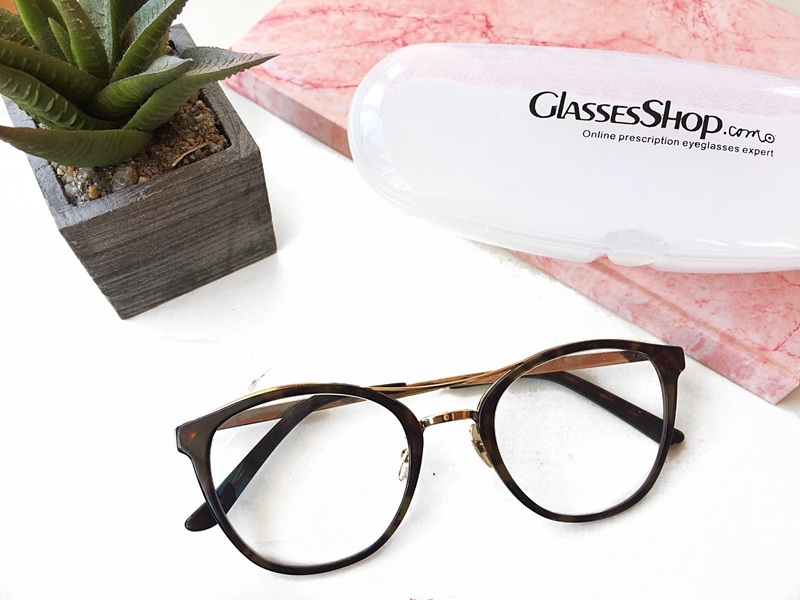 Have you ever bought glasses online and if you have, where did you get them? Let me know on Twitter, I would love to hear from you!